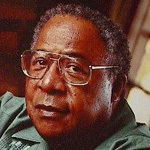 Alex Haley taught himself to write during a twenty year career in the U.S. Coast Guard. After retiring, he worked as a freelance magazine writer. His first book was The Autobiography of Malcom X, on which he was collaborator and editor. Roots: The Saga of An American Family was his second book, for which he was awarded special recognition from the Pulitzer Prize and National Book Award committees. He also wrote A Different Kind of Christmas, and Queen, a sequel to Roots. Haley died in 1992.